From its origin, JASC has been organized by university students who are interested in global and bilateral issues facing the U.S. and Japan. 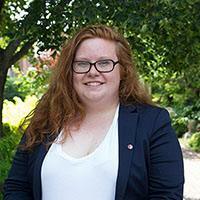 This tradition of student leadership has endured more than 84 years and is maintained through Executive Committees. 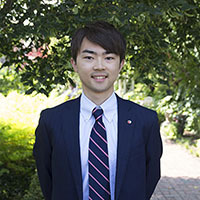 Each year, JASC's Executive Committee is comprised of unto eight students representing the U.S. and up to eight students representing Japan. Elected by fellow delegates, Committee members work jointly across the Pacific to create and implement the next JASC. Hi everyone! My name is Jamie Miura and I will be serving as the American Executive Committee Chair for the 71st Japan-America Student Conference. 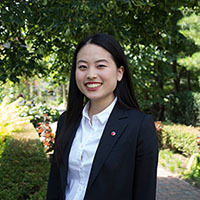 I am currently a Junior at McGill University majoring in Political Science and double minoring in Management and East Asian Cultural Studies. I was born and raised in Maryland and played ice hockey and tennis at Walt Whitman High School. At McGill, I am the President of the Japanese Students Association where we showcase Japanese culture to the student community. Outside of school, I enjoy Korean dramas, attempting to cook and following my favorite sports which include ice hockey, soccer, tennis and baseball. My father, a JASC alumnus, often used words such as “life changing” and transformative” to describe his time at the 39th Japan-America Student Conference. Just like any good son, I felt my father was lying. During the 70th Japan-America Student Conference, I learned that my father was right. I was able to build lifelong friendships, develop my perspective through discussions with my fellow delegates and network with leaders in politics and business in the United States and Japan. Ultimately, my time at JASC is something that I will cherish for the rest of my life because of the social, academic and professional growth that I experienced during the conference. The biggest lesson that JASC taught me was the power that students leaders have to truly create change. As a member of the American Executive Committee, I hope to create a 71st Japan-America Student Conference which will empower and inspire the next generation of leaders in the United States and Japan. Hello, everyone! 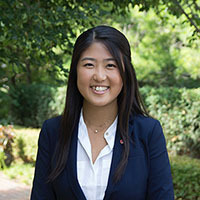 My name is Kaho Maeda and I am honored to serve as the Vice Chair to the American Executive Committee for this year's JASC. I am currently a Junior studying Political Science and International Affairs at Northeastern University in Boston, Massachusetts. Although I was born in Japan, I moved to the United States at the young age of two and grew up in the small town of Briarcliff Manor, New York. On campus, I serve as an executive board member for Peace Through Play, one of the largest student-run organizations at Northeastern. As a school coordinator, I bring club members into local public schools to work with young kids and promote peaceful conflict resolution. Additionally, I am part of the Big Sister Association of Greater Boston, through which I have been working with my 'little sister' for over a year now. Everyday, I strive to be a positive role model for her and provide any and all guidance that she needs. Outside of these activities, I love to play soccer, scuba dive, and travel! My JASC70 experience was shaped by the people: the delegates that inspired me to be better everyday and the Executive Committee that sacrificed so much to create a life-changing experience for us. Growing up in a Japanese household in the US, I constantly struggled with my own identity, as well as feeling a sense of responsibility to bridge the gap between my two cultures without knowing how to do so. But during JASC, my fellow delegates made me feel accepted while also challenging me; and I believe this environment made us all learn more about ourselves while simultaneously becoming more open-minded. As a member of the Executive Committee, I hope to provide the JASC71 delegates with the tools to shape their own experience and their own JASC legacy. Hello, all! 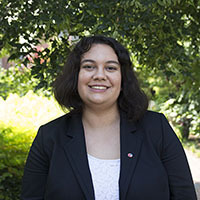 I’m Aimee Rodriguez, and I am from Anderson, South Carolina. 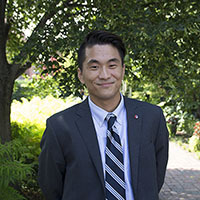 I’m currently a Junior majoring in East Asian Languages and Literatures (Japanese Emphasis) and Global History at Washington and Lee University, located in Lexington, Virginia. At W&L, I am part of our university’s Chanoyu Tea Society, where we learn, rehearse, and perform the Japanese Tea Ceremony following the practices of the Urasenke School. I am also part of multiple community service organizations that emphasize local outreach. My favorite service group is Rockbridge Animal Alliance, where I assist in monthly pet food pantries and pet health services during the school year. If I’m not in clubs, I can usually be found working at the University Library, or I’m with my cat, Naomi. JASC 70, I feel, was a life-changing experience for me on an individual and interpersonal level. One of my biggest struggles in life has been understanding myself and the world around me, so being an environment where I could openly communicate thoughts with others instilled a newfound confidence in myself. The cultural exchange was also incredibly influential for me in building new relationships with people and in understanding that any action can have a global impact. I sincerely hope that JASC 71 will empower delegates and give them the drive to support others. I look forward to meeting each of you, and hopefully you will have the same passion for JASC that I have. Hi everyone! 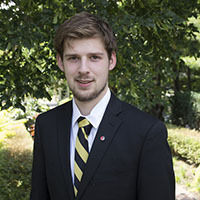 My name is Nathaniel Chute and I am third year at Wake Forest University in Winston-Salem, North Carolina. I am majoring in Politics & International Affairs and Japanese Language & Culture. I grew up in Wise County, Virginia and moved to Norfolk, Virginia for Middle and High school. I am heavily involved with many different tech organizations on my University's campus and I have always had a great interest in automation and programming. My hobbies involve video games, tinkering with my PC, and reading various works of older literature. This past summer I spent two months in Osaka, Japan and fell in love various parts of Japanese culture. I am extremely interested in Shintoism, East Asian Syncretism as well as Japanese Politics as a byproduct of this experience. After my time abroad, I attended JASC 70, an experience that I will forever treasure. Although I cannot convey the extent that JASC has impacted me, I can say that I have never built more special and precious connections with so many other people than during this conference. The panels, activities, reflections, and moments we spent together were incredibly special and amazing. JASC has given me so much confidence, strength, and personal growth and I can't wait to interact and watch the next generation of JASCers grow and discover their own JASC experience. I am honored to be a part of the 71st Executive Committee and to build the next generation of this prestigious and fantastic conference. Hey everyone! 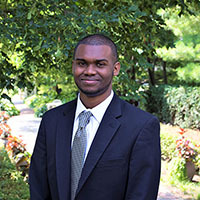 My name is Mason Williams and I am serving as the recruitment chair for the 71st Japan America Student Conference. I am currently a junior undergraduate student at the University of St. Thomas but I will be spending my 2018-2019 school year at Osaka Gakuin University in Osaka Japan. I was born in Maryland but I have lived in Delaware and Connecticut until I finally settled in New Jersey where I spent my childhood and adolescent years. In high school, I participated on my school's debate team and at the national level on the ethics team. It was in those enviornments where I developed a deep love of discussion based activities and the respectful exchange of ideas. In my free time, I enjoy watching anime, cooking, exercising and listening to music. My time in the 70th JASC constitutes one of the most amazing experiences I have ever had. From the incredible conversations I had with those in my roundtable to the various site visits, JASC was a way to connect my various interests back to Japan and meet like minded individuals invested in seeing the U.S.- Japan relationship grow. JASC is only three weeks: during that time it can be hard to envision how those you meet and the things you do will go on to impact your life outside of the conference. As someone who didn't realize the effect this experience would have on me all I can say is that JASC was worth every minute of my time and I'm honored and blessed to have the opportunity to serve the next delegation as an AEC. Hi everyone! My name is Makiko Miyazaki – I’m a junior at Wellesley College, but I am studying at the University of Oxford for the 2018-2019 academic year. My major is Political Science with a focus on International Relations; my other academic interests include astrophysics/astronomy, statistics, and learning languages (currently French and Chinese)! On campus, I sing in an a capella group, dance, play the organ in the college’s chapel, and contribute articles/papers for the school’s journals on international relations. I spent my childhood in Tokyo, Japan, but I have also lived in Switzerland (3 years) and the U.S. (10 years and counting). JASC 70 was hands-down one of the best experiences I’ve had in my life. I gained valuable perspectives by engaging in deep and sometimes uncomfortable discussions with my roundtable members, other delegates, and professionals. Working with 70 delegates of diverse backgrounds, viewpoints, and working styles made me learn so much about myself. But the most important takeaway for me was the people – the sense of community I felt was powerful beyond words, and I know the friendships I made will last a lifetime. I am so excited to meet all of you and hope that JASC 71 can be as special for you as JASC 70 was for me! Hi Everybody! My name is Teresa Wrobel and I am a junior studying Political Science with a focus in International Relations at the University of Alaska Anchorage. I am serving as the Social Media Contact for the 71st Japan America Student Conference. I am so honored to continue this tradition of fostering a community between Japanese and American college students. At school I serve as the Government Relations Officer for our student government, and serve on several university committees. I am also a part of our Model United Nations club, and am a part of Drag+, a club where we not only appreciate the art of drag, but work to provide a safer and more welcoming environment for all. Currently, I work at a local political non-profit that is focusing on salmon habitat protection. When I have free time, I really enjoy spending time with friends, listening to my constantly expanding music library, or going nice long drives to go and look at the Alaskan scenery. A really special moment for me at JASC was realizing how many lifelong friendships and connections had been made throughout our three weeks together. Not only have I come to find strength, understanding, and inspiration in some new friends that I will never ever forget, but I can tell that all my other fellow delegates have as well. I hope to foster this same kind of spirit at the 71st JASC, and continue this tradition of Japanese/American relations! Hi everyone! My name is Shunji Fueki and I am a sophomore at Soka University of America in Orange County, CA, majoring in International Studies. I grew up in Tokyo for 18 years and came to America for college. At Soka, I am an officer for the nuclear disarmament club where I helped organize a symposium and invited an atomic bomb survivor on campus. I also did Model United Nations, Haka dance (New Zealand indigenous dance), and kendo (Japanese martial arts). My hobbies include watching documentaries, reading literature, and traveling. This summer, I had a chance to go to Kazakhstan and had very interesting experiences there, such as visiting former nuclear testing sites or drinking camel milk. As I am studying abroad in the US now, I have always had interest in immersing myself in other cultures since it gives me new perspectives and broadens my worldview. With that said, I treasure every moment of my JASC 70. The experiences of traveling, discussing, chatting, laughing, and even crying together with other 70 students for three weeks are not something I can describe fully by words here, but these are the special memories that I will cherish for my life. JASC is shaped by its participants, and that is why JASC is different every year with different people. I think it is beautiful that JASC has fostered deep friendship between the United States and Japan throughout its dynamic and diverse history, starting before World War II. I am honored to serve as one of the 71st Executive Committee members for this historic conference, and I will strive to provide amazing experiences to the delegates! Can’t wait to see you next summer!! !